The crew and pilot of the Paresev 1-A and the Stearman Sport Biplane. You probably don’t think of NASA and hang gliding together, but their histories are interwoven. In the early 1960s, during the Mercury space program, NASA studied the feasibility of using a steerable kite-like parawing as a replacement for parachutes used then to safely land spacecraft on Earth. The project was called Paresev, an acronym for Paraglider Research Vehicle. The unpowered Paresev design was based on the Rogallo wing, conceived in the late 1940s by Francis Rogallo, an aeronautical engineer who worked at the Langley Research Center for the NACA (National Advisory Committee for Aeronautics, a predecessor of NASA). The unpowered, triangular kite had an aluminum frame covered in fabric. The pilot controlled the wing with an overhead stick. For tests, the Paresev was towed into the air by ground vehicles and aircraft, then cut loose to land on Rogers Dry Lake. The flights lasted minutes at most, sometimes just seconds. It was flown nearly 350 times to test four versions, all between 1962 and 1964. Ultimately the parawing wasn’t used for the Gemini or Apollo missions — parachutes brought the capsules back to Earth. But the NASA study helped popularize the Rogallo wing, ultimately popularizing hang gliding. 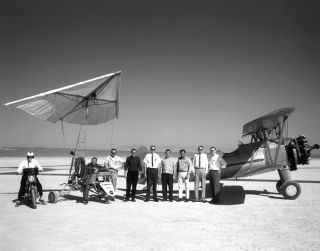 In the above photo, the Paresev 1-A and a tow plane — a 450-hp Stearman Sport Biplane — serve as a backdrop while the pilot and crew pose for this picture in 1962. Starting at left: On the motorcycle is Walter Whiteside, in the Paresev 1-A is test pilot Milton Thompson, Frank Fedor, Richard Klein, Victor Horton, Tom Kelly, Jr., Fred Harris, owner of the Stearman, John Orahood, and Gary Layton.